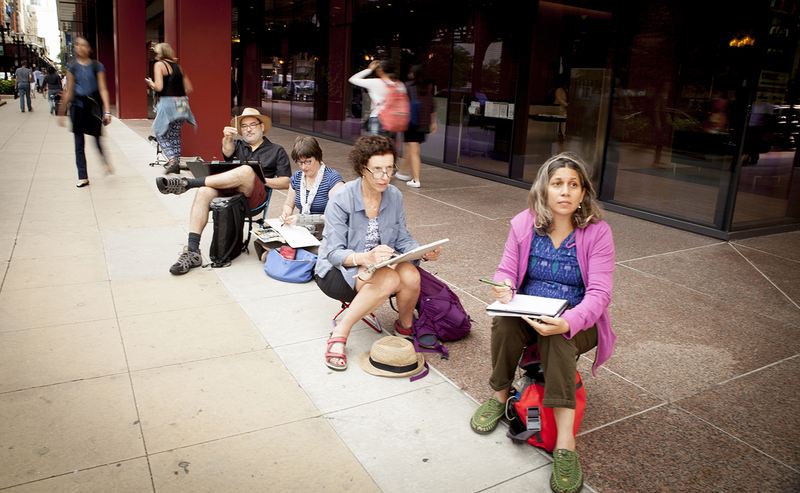 One of the great pleasures at this year’s Urban Sketchers symposium in Chicago was time spent sketching with friends both in the days before and after the event itself. It is both intimidating and exhilarating to sketch with this group, so I thought I’d share my work — not always successful or even finished — as well as links to what other people accomplished on these outings. The first group event was a trip to sketch both the interior and the exterior of Robie House — Frank Lloyd Wright’s landmark Prairie School building on the University of Chicago campus. A few of chose a simple view of the pathway and classic Wright partially hidden main entrance, but when I turned I saw that most of the group was seated under a tree across the street, drawing the full building. Have a look at Lapin’s sketches from Chicago, including a great one of the Robie House. A great symposium tradition is to get up early and sketch before the day’s events start. One morning a bunch of us sketched under the El train. I didn’t have much time so I drew it with a brush pen. Have a look at Marc Holmes’s sketches from Chicago as well as my favourite photo of this outing (by Laurel Holmes) of this group looking very perplexed by the complex train scene. So many columns to draw! And have a look at Suhita’s take on the El and her seven blog posts about what she sketched in Chicago. After the symposium was over (and I was almost too exhausted to walk) I spent a few days moving at a slower pace, visiting The Art Institute and sketching along Michigan Avenue, including a view of the Du Sable bridge. One evening Uma Kelkar and I went up to the top of the Hancock Building to sketch and watch the sunset. With all of Chicago below us we tried to capture the disappearing panorama. Have a look at what Uma did on her iPad. In the early morning, while waiting for the big doors of The Art Institute to open, my friend Alison Hall and I sketched The Lurie Garden in all of its wildness. From a shady spot under some trees you have a background of the skyline of Chicago and a foreground of wildflowers, bees, birds and pond-lined walkways. Thanks to some sketchers who had rooms at the residences of Roosevelt University, a few of us were invited to sketch the view from the 21st floor. This is a bit of a messed up sketch but have a look at Susan Cornelis’s blog to see us all sketching that sight. My last morning was spent sketching with one of my drawing heroes — Don Colley —who is a resident of Chicago and was one of the volunteers at the symposium. I did a final sketch of Grant Park and then spent a bit of time watching Don make magic with Pitt pens. A great way to end the week. Thanks to all my sketching friends who let me look over their shoulders (I couldn’t find links for all the work I wanted to show!). What I learned from you in a week keeps me going all year. Shari, these are beautiful! Have enjoyed seeing all the posts from you, Marc and Liz. Hope to attend one myself sometime. Thank you! I hope you’ll have the pleasure of attending a symposium someday Maggie. It’s quite the experience! Hi Shari, I’ve enjoyed your posts all summer long and this is by far my favorite! Thanks so much Minerva. I hope to see you at the vernissage this week at City Hall! Ah, Tim, you are very kind. Love these sketches and I could see me doing more Chicago sketching. It’s a city with personality that needs to shared! Definitely a city with personality. I was happy to have the time to get to discover it a little bit. It’s always like that at these events Tina. Never time to say more than a quick hello, although we always have good intentions about having longer conversations. These look so cool! You are a great artist! Wonderful sketches of Chicago!!! I’m glad you had some extra time to relax and sketch with friends. That is such a wonderful part of experiencing an area. As a participant I know how hectic the whole symposium experience is. I’m glad I stayed an extra day to sketch where I wanted…I should have stayed longer. I will definitely do that if I go to Porto. It’s always good to have a few extra days before or after to actually see the city! The sketch pal time was the best! Great sketches! 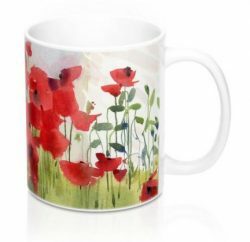 When I first viewed them I thought they were watercolor.Thanks for sharing! Hi Daniel. These are watercolour sketches. Thanks for writing. You are such an inspiration. Your blog is the best!